If you don’t know where you’re going, how are you going to get there? Creating a marketing plan doesn’t have to be hard. Join us for this 45-minute webinar to learn how to break down the components into eight simple steps to create a well-rounded marketing plan. 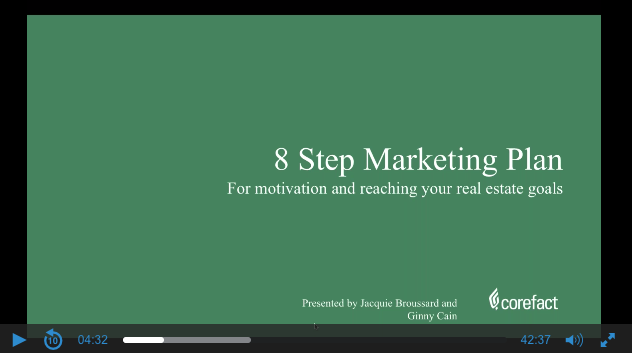 Presented by Senior Trainer Jacquie Broussard and Marketing Expert Ginny Cain. If you want to stay top-of-mind and grow your business in 2019 but aren’t sure where to start, you need to join us! You can also download a free real estate business plan template here. Are you a real estate agent looking for more listings? Targeting the best prospects with a distinct and effective marketing plan are the most impactful steps you can take to grow your market share. We understand that being successful in your own business can mean that you are often limited on time and money. Let us showcase some of our top products that have helped our clients gain back both! One of the most overlooked items in an agent’s marketing strategies is often what they say about themselves.